Indian cuisine varies widely across the country according to the region, culture and tradition, characterized by the use of different spices, vegetables, grains, fruits and a variety of animal source foods. Analyzing all the foods that are consumed in the country is not be feasible due to the prohibitive cost involved and thus it is essential to prioritize foods for compositional analysis. One method to set priorities is the ‘key foods approach’ which is defined as those foods that contribute upto 75% of the nutrients intake by the population. The method combines food consumption data with its nutrient composition, and ranking the foods by applying a scoring system to identify the key foods that contribute significantly to the diet in terms of their nutrients. Therefore, all foods analyzed were selected using the key foods principle constructing the IFCT 2017. The latest Indian food composition database funded by the ICMR covers all the key foods sampled from the entire country drawn from statistically valid sampling method. About 160 discrete food constituents including bioactive compounds were analysed for 528 foods. Region specific foods were analyzed for 6 regions of the country to enable region specific nutritional and epidemiological data interpretation. For every food sampled under this design, composite nutrient mean are determined for each region and the mean of six regions represents the country data, wherein standard deviation provides estimates of the content variability. 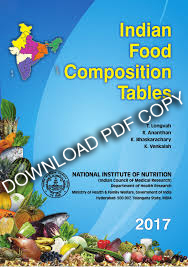 Keeping food composition data up-to-date is a continuous challenge and ‘Indian Food Composition Tables, 2017’ does not contain a exhaustive list of all foods consumed in India. Food composition tables are never complete due to the constant introduction of new foods into food supply, discovery of food components that are associated with health and disease, and continuous improvements in analytical methods and techniques. Therefore, analysis of Indian foods will be continued to enlarge the database according to need.